When you self-publish, there is much to learn. Sometimes you learn a lesson well, and other times you understand the spirit of the lesson without properly executing them. 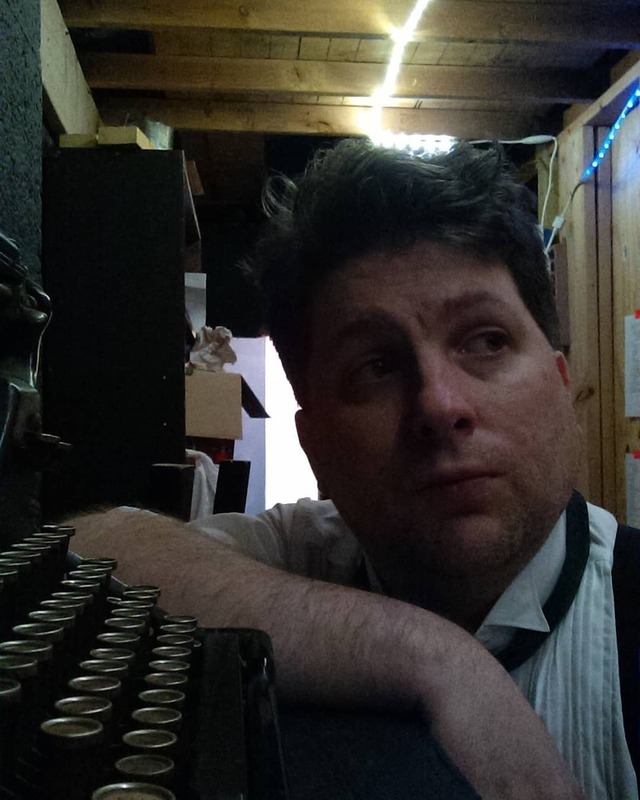 Such was the case for me in regards to the e-cover for my upcoming collection of short stories, Thank You For Ten: Short Fiction About a Little Theater. On Monday, I revealed an e-cover I was proud of. One that I liked. One that I built upon a background image I had purchased from from an online store and designed by one Bee Javier. Taking to heart the lesson that simplicity is usually best for such things, I desired only to include some nicely formed letters on the cover image; the title and my name. Not only did this go well with my overall minimalist ascetic in life, but it kept me out of the thicket of totally designing my own cover. Unless you have experience doing so, you are advised against trying that. I had no problem adhering to that wisdom. Yet the simple cover I unveiled on this blog on Monday (in a post I have since taken down) was not, it seems, suited for the purpose. That at least according to a fellow self-publisher. Though my own understanding of the instructions at the place of purchase indicated that the cover would suffice, it seems my addition to the image, simple as it was, was not suited for that purpose at all. Differences in appearance that seemed initially to me to be only a matter of viewing sizes adjusted for this blog were, it would appear, due to my design flaws in the file itself. Even by choosing to be simple, I had not done it right. And this angered me on the day. Truth be told, I am still somewhat angry about it. The entire incident proved to me that despite research and thought put into every step of the decision, I didn’t understand the concepts properly. As a result, not only was my first cover ineffective, but I came out looking foolish for all the internet to see. The thrill of the reveal was short-lived to say the least. Yet an e-book needs a cover, and mine needed one quickly. With just about a month before my launch date, (June 21, by the way), I had to release any loyalty I had to my original vision of the cover, and just get a good cover that fulfilled the technical requirements. Which meant the entire affair was above my pay-grade, to be frank. As she has often done previously, she helped me clean and sort out a technical mess of my own creation. (See also: the “About This Site” section of this website.) She stepped in and after experimenting a bit and showing me some options, came up with an alternative cover for the collection that maintained the spirit of my original, even maintaining my original purchased background image. Below is the cover she came up with, with proper technical aspects this time. The Cover. For real this time. The background image is representative of how stages were once constructed. Planks or boards were assembled to create the performance space. Though stages are not usually built this way today, and though the stage in my stories is not like this, the legacy of such early stages lives on in theater lingo. Even today you will sometimes hear stage acting referred to as “crossing the boards”. This background image embraces that metaphor. The colors are earthy and organic. Minimalist. Much like my original concept. There is even some green to hearken back to a theater’s “green room”, which makes several appearances in the stories of this collection. And there you have it. The now true and technically sound cover for the short story collection. My public thanks again to J. Lea López for taking the time to do some mop up. Do consider purchasing her fiction. 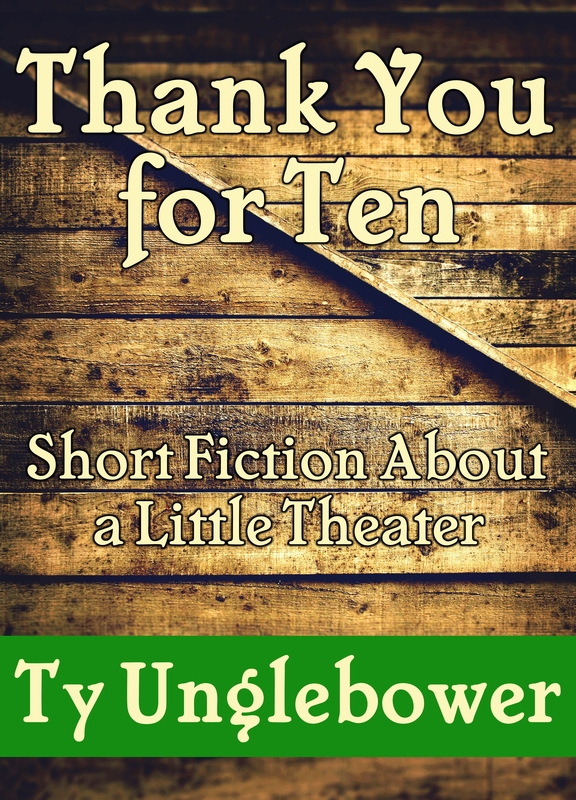 As for Thank You for Ten: Short Fiction About a Little Theater, it will be available for purchase and download starting June 21st from most of your favorite e-book retailers. Cover design is definitely a challenge, especially knowing how little time you have to grab people’s attention. I like this, the dark at the top allows the title words to,stand out well. I like that cover! Congrats! And I also really like the title and subtitle. People may or may not judge a book by its cover (I mean, I do, but hey), but many definitely judge a book by its title. It’s clever and it also actually tells you what it will be about. Thanks to both of you for your comments on the cover. I was nervous for a while, but I am getting some good feedback from folks, so while I was always happy with my choice, I’m even more excited about it to see the response!